Army Humvee - Pinewood Derby 3D Design Plan - INSTANT DOWNLOAD! "Excellent design...easy to do. We made "bore holes" in front, top and the two recommended in the back to add weight, then covered with wood glue. The design won award for best looking car, and we also won the local race...faster then it looks." 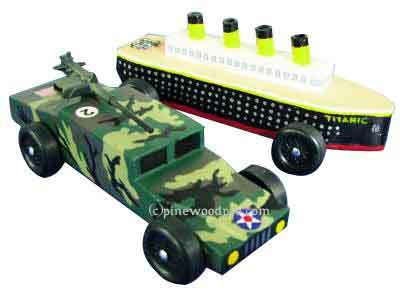 Roll over the competition with the Army Humvee Hummer pinewood derby car design. This is an easy car to build! This design comes with a complete 3D plan with clear, step-by-step instructions, as well as 3D AutoCAD graphics to help you build your car. This plan also helps you with weight placement, gives you speed and building hints, tells you exactly what tools you'll need, and includes car cut-out templates for use as a cutting guide. We'll even show you your Humvee rotating 360 degrees so you can view it from all angles and we'll let you see your car in 6 different colors to help you decide your own color! Pinewood Pro's 3D derby car designs are the best on the market, guaranteed! Build The J19 Army Humvee Pinewood Derby car with our easy step-by-step instructions, fully illustrated with 3D images that show each cut, along with templates, weight placement, speed tips, building hints and painting guide. Each car design plan comes with cut-out templates so you can't make a mistake. plus give you a 360 degree animation of the final car so you can view it from all angles! Below are some sample pages from one of our car design plans. Each plan is over 30 pages of detailed step-by-step instructions, essential speed tips, color schemes along with direct links to everything you need to make your car. 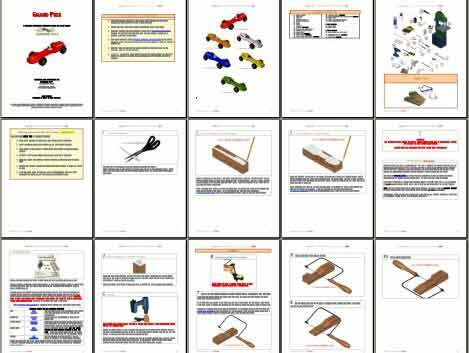 Pinewood Pro 3D pinewood derby car designs - the best on the market, guaranteed! Visit our full pinewood derby car picture gallery and enter a picture of your car! Fastest time of the day! The plan was simple to follow. We added the gun and some exhaust stacks, (purchased at Hobby Lobby) and painted it. This was our first car so I was surprised at how much weight we had to add to get it to the 5oz. But we took 1st place in the Tigers and had the fastest time of the day! Thanks for the help! PS It looked like the one I used to drive! Easy to cut, and the flat camoflauge paint job is easier and more forgiving than a highly polished model. Won 1st place in my son's Den race, and also won Concours. Had some trouble in the Pack finals though, and only placed 4th, but still a good design overall. Easy download, easy design. My son had a lot of fun helping paint this car. Didn't place but the memory will last forever!! I have used these plans 2-3 times now. Money well spent given the amount of time saved. Good design, easy to use directions. Only trick is to ensure your printer settings are set properly to print to scale. While one could imagine making these cuts without the instructions, the template made it easy to get the proportions right. The car looked very good in the end. This plan had great information and advice. My son went from last place in 2012 to 2nd place finish in 2013! Thank you for all the tips, hints and tricks on making the car faster and getting just the right weight! thank you! We will definitely be ordering another card design next year! These are the second set of plans I've purchased from Pinewood Pro. They are well thought out and easy to follow. Bothe of our cars have turned out great, and they raced very well! I followed along page for page and I could not have completed the project with out it. Pinewood Pro makes car design and layout simple and easy to master. The templates and extra information are great and simple to use to create a different car/truck that will set my son's entree apart from the rest. it was a success at the race. everyone there loved it. my son took first place for most realistic, second place in his pack, and third over all. the only thing i would have done different is, i would put something on the tires to make them spin more freely. but otherwise well worth the money. The car was a lot of fun to build My son and I painted it purple, black and white. we added some stickers and made it a Baltimore Ravens hummvee. Looked fantastic but wasn't that fast. My son won 1st in show for the kids and adults with his Humvee Car! Very satisfied this car design plan. This was his last year in Cub Scouts. Thx! This was a fun and great first time durby car project for me and my step son. He loved the design of the Humvee and he did everything except for most of the wood cutting he got tried so I had to finish the job. Thanks for the easy instructions and this was a great project to be able to do with him. We liked the Army Humvee plans. It was easy to cut. I had difficuty wiith making the hood rounded as pictured but other than that it was easy to do. We won our pack's derby oiut of 27 cars! My son came in second place! Easy to follow and included good hints in directions. Instructions were well documented and pictures were clear, easy to build and great looking car. My son won first place in the Wolf den races and most creative in the pack. Son loved building this car and it came out cool. My son loved it and so did everyone else . He took 1st place in his heat and eventually took grand champion . Our grandson in California wanted a military vehicle for his pinewood derby. We sent him this one, along with the military skin we purchased from this site. The car was easy to replicate, the skin, not so much! For a first timer like myself this product made everything so easy. I'm not a handy man but I didn't need to be, I just had to know the basics. Our car turned out great this year. Much nicer than last year and I only had a week to build it. It wasn't a difficult shape to cut. I would have liked to front to have been a bit more authentic in the shape. Not sure it the weight holes caused the car to be too back heavy. I would build it different with the weight a bit more forward over the back wheels. My son loves camouflage designed cars so we picked this one. The instant download is great for beginning quickly and having plans uploaded on the computer to read or print as needed. The design came in 3rd place in his race and at times beat other cars. The winning secrets book with prep ideas was a tool I used but didn't follow all the steps so our car could have been improved with using some or all of those ideas. Great instructions...easy to follw & build!! My son really liked hte end result of the Hummer. We used a dremel, so it didn't turn out exactly as the pictures, but it was definitely close enough. I liked having the ability to download the plans immediately as well. Had a great time working with my son on this project. He is only 7 and was able to do all the cuts himself, with some guidance and supervision from me. He also did a mojority of the painting. We did 3 colors and made a nice camoflage Humvee. He just missed the finals as well. Very fast vehicle despite the "clunky" looks of a Humvee. The plans were excellent. I'm not very handy with toold, so the step by step really helped a lot. This one was a lot of fun. My son picked out all the colors we used, and added a lego soldier to it, along with a couple other details. Excellent design...easy to do. We made "bore holes" in front, top and the two recommended in the back to add weight, then covered with wood glue. The design won award for best looking car, and we also won the local race...faster then it looks. My son and I really enjoyed these step by step plans they made this project a great success, and our second year running a major difference knowing we didn't have to stick to the same plans year after year. Please continue to help inspire us with grand ideas.